Compared are the US R-Rated DVD by Vidmark/Trimark and the Uncut Unrated Version which was taken from the German DVD by Laser Paradise (not rated). 4 cuts in the R-Rated Version = 7.5 seconds. 1 extended scene in the R-Rated Version = 2.5 seconds. 1 alternate scene = 8 seconds. 31 alternate scenes without difference. 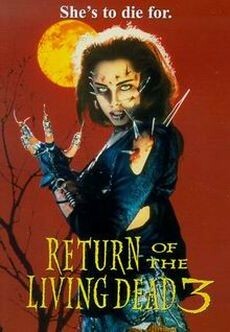 Brian Yuzna's third of the five-part movie series is by far the best one of the entire series. While RotLD 1 + 2 were average horror flicks and RotLD 4 + 5 were on the lowest possible level, RotLD 3 is pretty convincing and worth being watched. One of the reasons are Steve Johnson's incredibly awesome SFX (he also did the SFX for A Nightmare On Elm Streeet 4 for instance). In the US, two versions were released: an R-Rated and a longer Unrated Version. There aren't many cuts in the R-Rated Version. In most cases, the R-Rated Version contains more harmless alternate takes of the violent scenes. Shot of John and the other staff members in the control room. After the scientist raised his wounded hand, blood splatters - but only in the Unrated Version. The end of the shot of the zombie with the fingers in his mouth plus the beginning of the shot of the screaming scientist holding his wounded hand is longer in the Unrated Version. The R-Rated Version contains an extended shot of the monitor instead. The zombie stabs the scientist one more time. Shot of the horrified staff behind the glass and the second scientist. All of them are watching what's going on. In the Unrated Version, the scientist gets stabbed more often instead (four times). In the R-Rated Version, the second scientist opens the suitcase to reach for the gun. Shot through the glass in the Unrated Version: the zombie smashes the scientist's face against the glass twice. The head gets smashed twiced against the glass. The R-Rated Version only contains the first one, then a cut to John. Extended shot of the dead scientist in the R-Rated Version. The Unrated Version contains a shot of the bubbling wound on the scientist's back of the head instead. Alternate shot of the zombie scientist crawling to the others in either of the versions. The R-Rated Version stops down just before the zombie bites the scientist's leg, followed by a shot of another scientist. The Unrated Version continues with the actual shot and shows the zombie biting the scientist's leg. Blood splatters. Alternate footage of the zombie attacking the scientist on the ground in either of the versions. The zombie bites his leg. In the R-Rated Version, the other scientist reloads his gun. The zombie puts a piece of flesh from the dead guard in his mouth only to let it drop again. The R-Rated Version contains shots of Curt, Julie and the zombie without flesh in his mouth. In the Unrated Version, the zombie keeps eating the dead guard. The R-Rated Version csticks with the camera instead. In the Unrated Version, Julie puts the needle in her hand more often. The R-Rated Version contains a shot of Curt behind the steering wheel. Alternate footage of the Asian salesman getting his head blown off in either off the versions. The body with the mutilated head drops on the ground of the van. The Unrated Version contains a close-up whereas the R-Rated contains a distance shot. In the Unrated Version, Julie eats the salesman's brain. The R-Rated only contains a distance shot of that plus an intercut to Curt. Curt grabs Julie and tells her to stop but she keeps eating anyway. The R-Rated is slightly different here. The zombie rams an iron bar in the cop's eye while he's firing off some shots. The cop goes down while the zombie keeps pushing the iron bar in his eye. Therefore, the R-Rated Version contains an extended shot of the other cop. Extended shot of the cop in the R-Rated Version. Extended shot of the zombie eating the cop. Extended shot of the zombie in the Unrated Version. Shot of the cop in the R-Rated Version instead. Close-up of the bloody shot wounds when the cop shoots at the zombie. The R-Rated Version only contains a shot of the zombie's upper body. In the Unrated Version, Julie pushes a aspiral spring in her arm. The R-Rated only shows her face plus Curt. Julie shoves a piece of glass up her hand. The R-Rated shows Curt instead. Julie reaches for the dead baddie's head and rips it off, including the spine. The R-Rated Version contains a shot of Curt and Julie instead. Julie smashes the baddie's belly with a stone one more time while the R-Rated shows a shot of the woman. Julie tears the baddie's lips off. And again some alternate footage in the R-Rated Version. The zombie snaps off a piece of flesh of the woman's neck. Riverman in the R-Rated instead. Alternate footage in either of the versions when the baddie's head and spine gets tossed in the corner. The last shot of the zombie's face getting steamed is missing in the Unrated Version. Instead a shot og Julie in Riverman's arms in the R-Rated Version. Alternate footage of Julie eating Riverman. Julie puts a piece of Riverman in her mouth and licks her bloodstained lips with the tongue. Tracking shot of Riverman as zombie in the Unrated Version. The R-Rated Version contains more harmless alternate footage again.